A Hotelier's Life (the Montien Bangkok's Roland G.
is a third generation journalist from Canada. He is the grandson of William Ewart Gladstone Murray, the first general manager of the Canadian Broadcasting Corporation. His father, Ian Mackay Gladstone Murray was also a producer with CBC news. Scott has been based in Bangkok since March of 1992 and was the Managing Editor of Siam Trade, Thailand's leading English language business magazine, for years. He is currently the resident writer for the Thai-Canadian Chamber of Commerce's magazine, Voyageur. Over the years, Scott has been a regular contributor to the Bangkok Post (www.bangkokpost.com), Metro (Thailand's leading English Entertainment monthly), Farang (Thailand's untamed travel magazine) as well as www.zingasia.com, a leading leisure and entertainment Internet portal. He was also the Bangkok content editor for www.wcities.com and www.homenothome.com, worked as a sub-editor for Business Day (http://bday.net) and was the Bangkok correspondent for www.cargonewsasia.com. Scott has traveled around the region extensively and has interviewed many prominent personalities, ambassadors and powerful CEOs. He has also devoted a great deal of his reporting to publicizing needy causes. And he is the captain/coach of Thailand's ex-pat ice hockey team, the Flying Farangs. 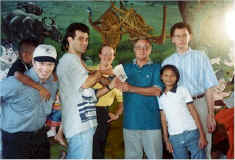 Scott, along with CNN’s Tom Mintier, was also a 2003 Thailand winner of the Marriott Golden Circle Awards presented to journalists who report on trends and developments in tourism; who have demonstrated excellence in tourism reportage; whose body of work has contributed to promoting a worldwide understanding of travel and tourism as a potent vehicle for economic development and peace. "Intrepid journalist looking for any remaining Viet Cong in the tunnels of Cu Chi."